Today I’m sharing a fabulous Vintage Pierrot Clown Image! This is a fun old Advertising Card! 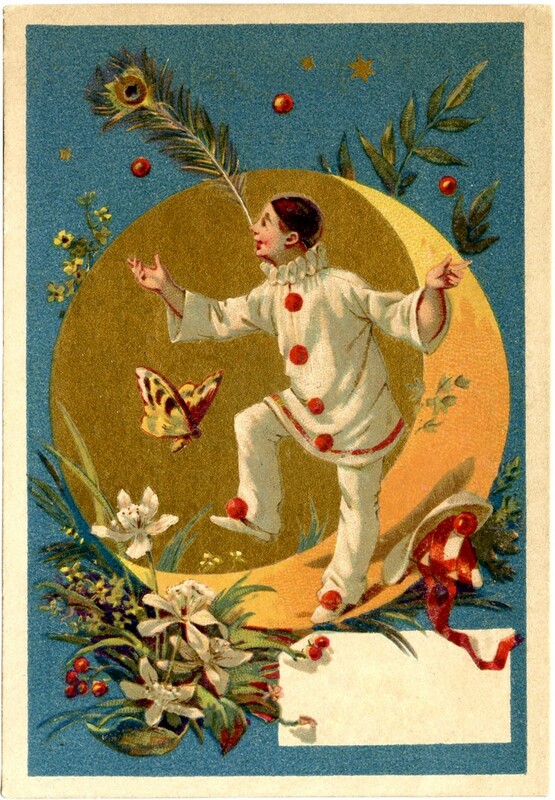 The card shows a Man dressed in a Pierrot Clown costume, with Red Pompoms on it! He’s juggling 3 red balls while standing on a golden crescent Moon! I love the colors on this one! There is a small blank portion near the bottom of the card, that’s the perfect spot to add a bit of text. This would also make a cute Gift Tag or Journaling card! Fun for Mardi Gras projects too! This is actually the second one in this series, you can find the first one, a Harlequin Lady HERE. 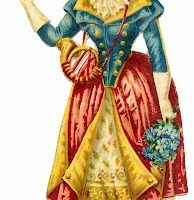 Vintage Advertising Clip Art – Stunning Ice Cream Girl Antique French Image – Women with Tricorn Hats Antique Piano Sign Image! Thanks for the clown image, Karen! It is wonderful.